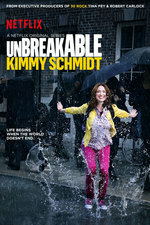 Unbreakable Kimmy Schmidt: Kimmy Meets a Drunk Lady! Now That Sounds Like Music 3 is far and away my favorite running gag in this entire series. Just gonna lay that out here. It's kind of hard to remember what happened in which episode, which is always the problem with discussing individual episodes of shows that are released in bulk. But especially this show, where the brilliance is in the small, throw-away gags. That said, I really love Tina Fey's character. Someone who is even more messed up than Kimmy, but who can help her. I feel like this character almost represents the central thesis of the show in that way. That said, I really love Tina Fey's character. Me too. I like that it's normalizing for Kimmy to realize the veneer of having it all together is just that. I've been struggling with this season (yeah I guess I'm one of those pesky internet haters!) but I did utter a lot of mildly horrified guffaws at this episode. The funny thing is just last night I was thinking, "Gosh, I miss the Arch Deluxe" and then today I watched this episode and Titus went on his disgusting landfill adventure! I laughed...and gagged. But I did laugh! The absolutely legal music is literally the best gag of both seasons of this show. At the very least it's my favorite. God, the music was great. Where can we get this album? Andrea is quite a character, indeed. Wow.